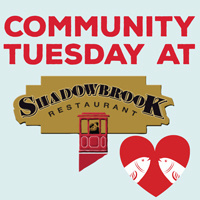 Join the Seymour Center at Shadowbrook Restaurant for Community Tuesday. On April 16, one-third of your evening’s food and beverage sales will be donated to the Seymour Center, if you tell your server you are a Seymour Center supporter! Dine out with your friends, enjoy a scrumptious meal at this iconic restaurant, and do good for the ocean!